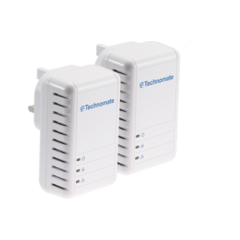 With the TM-85 HP you can extend your home network by using electrical sockets. Forget about drilling and rewiring cable throughout your house, with the TM-85 HP you can have internet anywhere in the house (on the same powerline) in a simple and convenient plug 'n' play system with no set up required. Complying with the HomePlug Turbo standard, the TM-85 HP gives you a data transmission speed of up to 85Mbps, together with the built-in QoS that gives bandwidth intensive and sensitive applications a higher priority to remain stable and fast. No complex configuration is required for installation, just plug one adapter into a power outlet, connect it to your computer via the network cable, plug the second adapter into another power outlet and you are ready to go! With the new ultra-compact housing design, the TM-85 HP is much smaller than most other 85Mbps HomePlugs and won't block the switches on your power outlets. Designed in an elegant white casing, it blends in front of any power outlet.